Can You Tell If a Stock Dropped Historically Below Your Market Return? When you choose to make an investment, ideally you want to see it generate a certain amount of return. And while there is no surefire way to predict future performance, you can examine past returns to get a sense of how much you’ll earn over time. 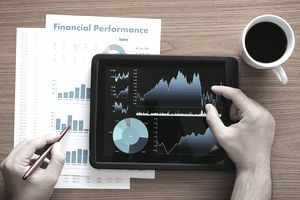 In addition to looking at a stock’s average monthly and annual returns, it’s helpful to review how often—and to what degree—performance deviates from that average. You can examine instances of when the stock exceeds or falls short of that average to determine its standard deviation. Standard deviation can be a useful metric to calculate market volatility and predict performance trends. But for many investors, it is more important to focus on the instances when the stock falls short of the average. And this measure is called downside deviation. Everyone likes it when a stock exceeds expectations. But it’s a much bigger deal when it fails to deliver the returns you want. Generally speaking, you want an investment that has consistent, positive returns instead of one that has wild up and down swings. And downside deviation can help you calculate the downside risk on returns that fall below your minimum threshold. A stock with high downside deviation can be considered less valuable than one with a normal deviation, even if their average returns over time are identical. That’s because when a stock dips, it will require higher returns in the future to get back to where it was. Downside deviation can be determined through a relatively simple formula. To illustrate this, we’ll examine the performance of a fictional company, OmniCorp. As we can see from these results, the average annual return was 4.6%, and there were four periods were the annual performance was lower than your MAR of 5%. To begin to determine downside deviation, let’s subtract your MAR of 5% from these annual totals. The next step is to square the differences. Then we add these figures, for a total of -170. At this point, we must divide this figure by all the periods (in this case '10'), and then calculate the square root. -179 divided by 10 is -17. The square root of this is about -4.23. So we can now say this investment has a downside deviation of 4.23%. Now that you know how to calculate downside deviation, how should it be used when evaluating investments? Numbers don’t mean anything in a vacuum, so it’s best to compare the downside deviation against other investments. For example, let’s say you invest in another company, American Computer, Inc. This stock shows three periods where returns were lower than the MAR of 5%, with a difference of 1% in each instance. The total of these three instances is 3%, and when we divide by the total of 10 periods, we come up with 0.3. The square root of .3 is about 0.55. Thus, we have a downside deviation of 0.55 for American Computer, significantly lower than that of OmniCorp, despite showing the same average annual returns. This matters to you as an investor, because it’s preferable to have consistent, positive returns from a stock than to see volatility. It’s especially important for short-term investors who would be hurt by any sharp downturn in the value of their stock portfolio. You can use downside deviation to determine something called the Sortino Ratio, which is a measure of whether the downside risk is worth it to achieve a certain return. The higher the ratio, the better for the investor. So in the example involving OmniCorp, you subtract 2.5% from 4.8% to get 2.3%, then divide that by the downside deviation of 4.12. The result is 0.54. Using the same formula with American Computer, the result is 4.18%. Thus, you can argue that American Computer is the better investment, despite having the same annual returns. Downside deviation can help investors calculate price volatility. Unlike standard deviation, this measure only focuses on downside returns that fall below minimum investment thresholds or acceptance returns. While downside deviation can be more calculated, the use of historic low points will help you predict possible return ranges for when investments underperform.